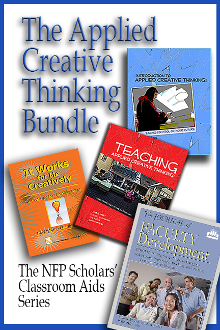 The Applied Creative Thinking Bundle includes the works Introduction to Applied Creative Thinking, Teaching Applied Creative Thinking, It Works for Me Creatively, and a free one-year online subscription to The Journal of Faculty Development. We further encourage you to sign up for the free eNewsletter, Applied Creative Thinking. Reporting the latest in professional development activities at the 2-year college, 4-year college, and university levels. — A highly successful stand-by that addresses concerns for your most valuable resource, PEOPLE! It is the one medium in higher education strictly addressing both the practical and theoretical aspects of the planning, design, implementation and evaluation of practices and programs leading to effective and efficient institutions and individuals.